Consider a metronome. A metronome is a device that keeps time for musicians. A metronome keeps a regular, fixed, and consistent tempo. It is, by its very nature, reliable. The metronome is the North Star of tempo. You keep up with it because it is the standard. Beausoleil is a “brunch metronome”. Every brunch adventure there contains great flavors and welcomed reliability. The restaurant advertises “contemporary Louisiana cuisine in a casual neighborhood bistro environment”. The French translation of Beausoleil, “beautiful sun”, seems well applied in this family friendly environment. This couldn’t be more accurate. Week in and week out, Beausoleil consistently showcases what is best in brunch: good service, a balanced menu of refined taste and comfort food, live music, and a neighborhood feel. Each time the brunch beats to another fantastic experience. The service at Beausoleil is outstanding. Your glass will never be empty. Wait staff is informative, helpful, and very attentive. Special requests are welcome. There is also a certain patience that comes with the attentiveness. It’s ok to sit and relax and enjoy yourself and the live music. Beausoleil has an excellent and diverse bar. If you are looking for New Orleans style beverages, they have them. 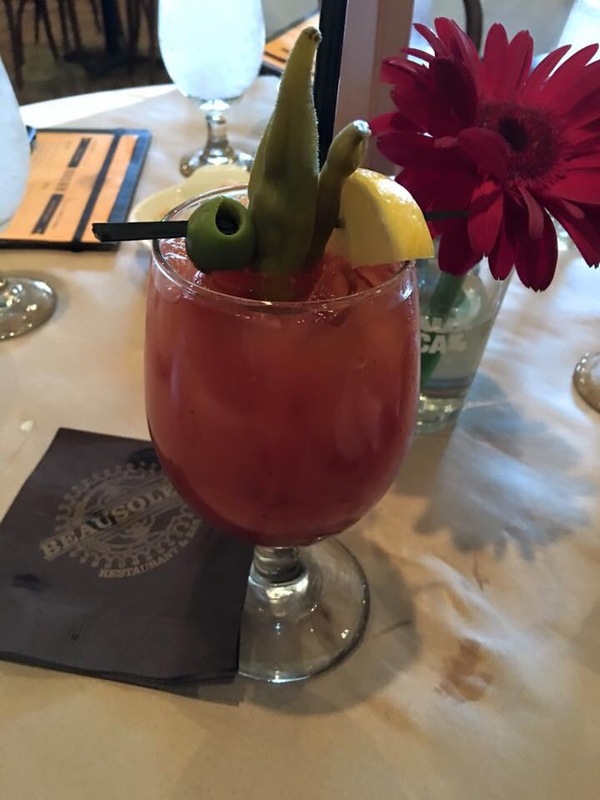 The Blood Mary was on point and well filled with tasty foliage. The mimosas are also great. Also, both the Bloody Marys and mimosas are discounted for brunch. 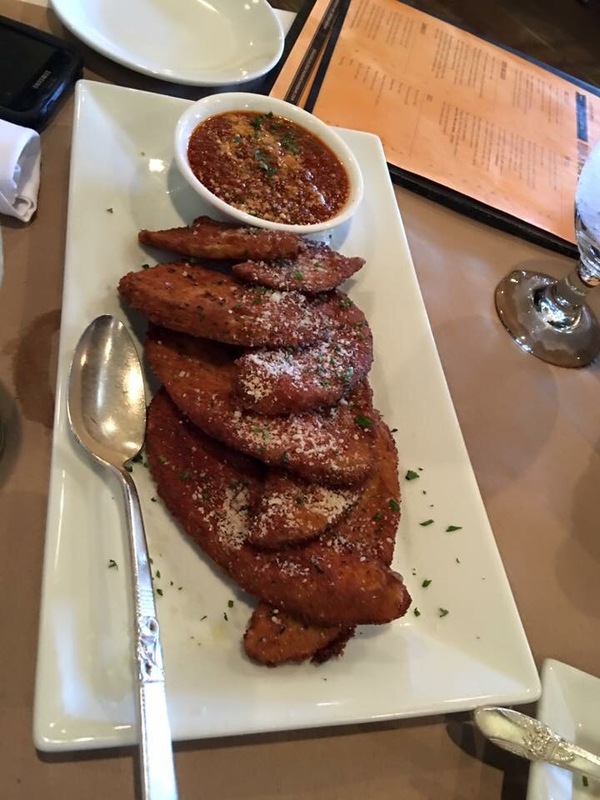 For starters you must try the “Fried eggplant crisps with Creole sauce”. The eggplant was fried to perfection and the sauce is a great complement. It’s also a nice shareable serving. The Creole sauce is a game changer. 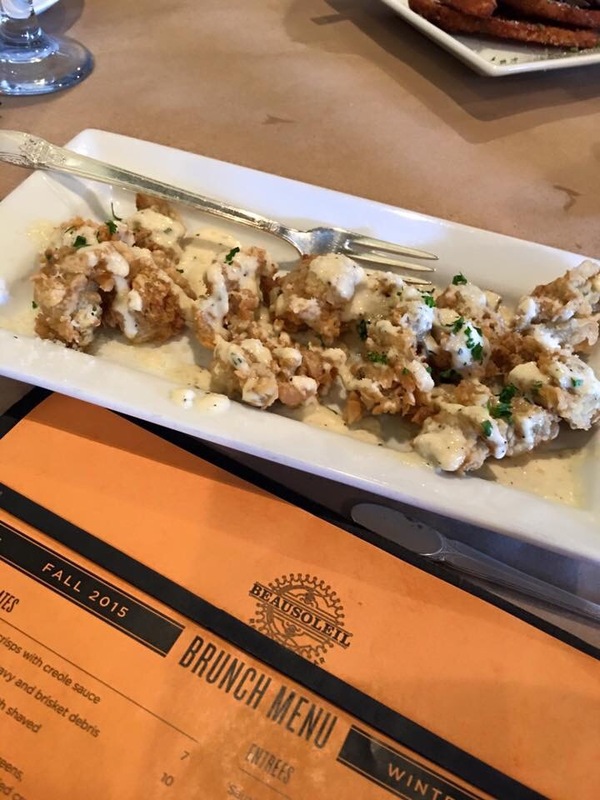 You also need to try the “truffled fried oysters with shaved Parmesan cheese”. The oysters were also fried to perfection with a delicious blend of flavor. Be advised that there is a bold presence of garlic in the dish. If you don’t like garlic, then you might want to consider something else. Lastly, we sampled the “cheese fries with gravy and brisket debris”. This tasted like perfect Sunday comfort food. After a long weekend of Mardi Gras Balls, this dish served an excellent purpose. The brisket was delicious and Beausoleil has some of the most well executed French fries in town. You would do yourself a favor to try the “Boneless fried chicken breast and country sausage gravy with a house-made biscuit”. When you order it, ask for a fried egg on top. You will not regret this move. This dish is a strong brunch staple and was perfectly presented and executed. Our favorite. 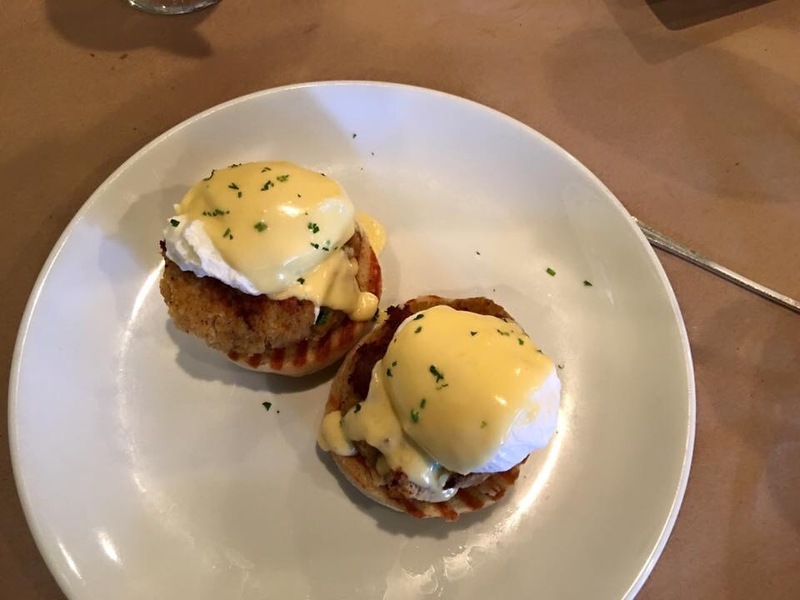 We also tried the “Louisiana jumbo lump crab cake benedict with poached eggs and hollandaise”. The crab cake was outstanding. The eggs were perfectly poached. The bread wasn’t a symphony, but complemented the rest of the dish. 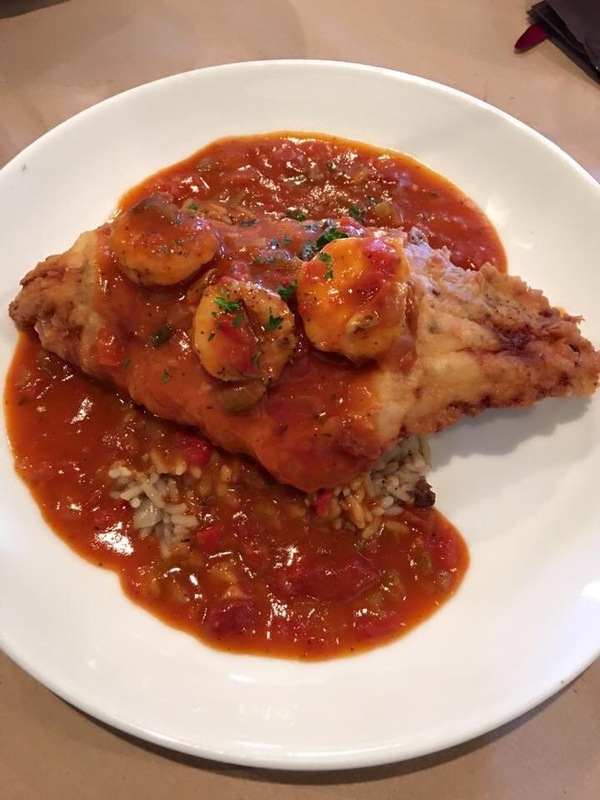 We loved the “Fried Louisiana catfish topped with shrimp sauce piquant and served over dirty rice”. The fried catfish was crispy but not overpowering. The sauce piquant is something akin to a childhood memory of a grandmother or other sagely family member cooking a sauce piquant from an ancient family recipe. It was magnificent. Duck confit hash, in our humble opinion, is the flagship of the “sides menu”. It is just a wonderful side dish (also try topping this with a fried egg as well). Our order was slightly burned this time but was still delicious. Did I mention you should order it with a fried egg on top? Our only regret from this week’s brunch was that we couldn’t try more of Beausoleil’s dishes. Perhaps this was purposeful so that we would have to go back. Again and again. We want to try the Croque Monseiur. If you want a great culinary brunch experience or if you just want some good old fashioned comfort food, Beausoleil will be music to your ears. Like a metronome, it is consistent each and every time. 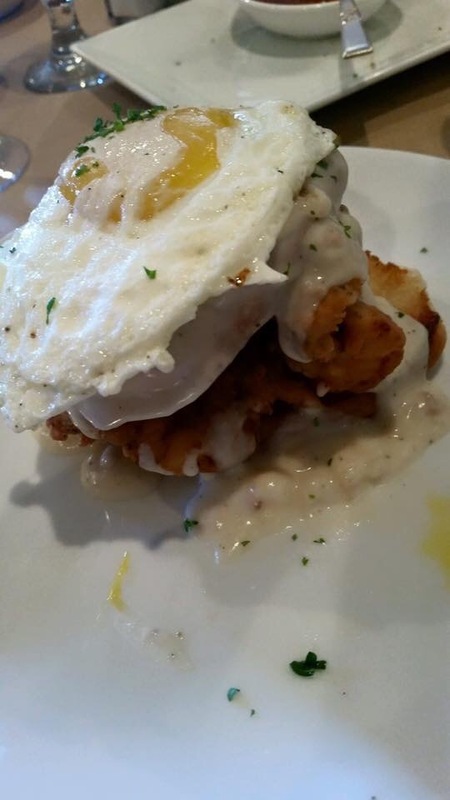 Beausoleil is one of Baton Rouge Brunches’ favorites.